Why Did Rick and Morty Season 3 Take So Long to Make? If there is one animated show that absolutely exploded in the last year, it is without a doubt Adult Swim's Rick and Morty. The show had a tremendous first season, but it caught on like wildfire in season 2, and now fans are absolutely clamoring for more. During the show's panel at San Diego Comic-Con over the weekend, the subject of season 3 inevitably came up. Creator Dan Harmon addressed the fact that the new season of Rick And Morty is taking more time to make, but it is for good reason. 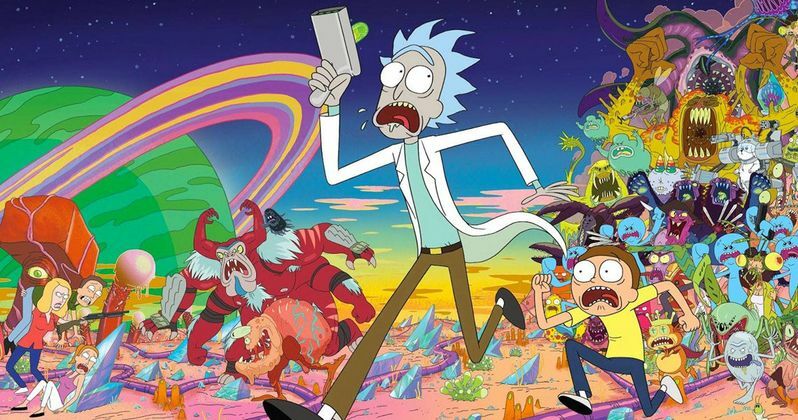 During the Rick And Morty panel at SDCC, which has since been uplaoded to YouTube, Dan Harmon discussed the unusually lengthy process that is keeping fans from getting to see season 3 sooner rather than later. Fortunately, his answer is very reasonable and shows that everyone working on the show is taking things very seriously, which only bodes well for fans of the show. Here is what he had to say. "It's been harder this season...I watched the thumbnail animatic of Episode 304 and I was ready to move forward with it and Ryan [Ridley] said 'we're not satisfied with it' and we were already behind schedule. They have to bear the brunt of the schedule, they have to work weekends. They are the ones that wanted to do it. There's a weird higher calling there and it's not an endless perfectionism because you know when something finally clicks and you go 'this is a good episode of TV.' But it's not just me and I was very happy to find that out." Based on what Harmon had to say, it seems like everyone is pouring their heart and soul into the third season, which will likely only mean a better result for fans at the end of the day. Rick And Morty already has a difficult and time consuming production, because of the way the show is made. Justin Roiland, who co-created the show and voices both Rick and Morty, essentially riffs most of the lines working from a rough story script, which is why the dialogue feels the way that it does, with all of the pauses and stuttering. This makes the animation process a little more difficult, because the animators have to work with what Roiland winds up delivering, as opposed to knowing exactly what he will be saying. Because season 3 of Rick And Morty is still buried deep in the production process, the creators couldn't show a whole lot at the panel. But that doesn't mean they didn't come with some surprises for those who waited in line for hours to get into the panel. Justin Roiland treated fans to something special, and very funny. He took a transcript from a very bizarre Georgia court case and read it word for word over a rough animation, in the voices of Rick And Morty. Lucky for us, that video has also made it online. Adult Swim has not yet set a premiere date for season 3 of Rick And Morty, but it is expected to debut in late 2016 at some point. The wait will likely be worth it, as the network increased this season to 14-episodes, as opposed to 10-episodes that season 1 and 2 received. For now, you can watch the video of Roiland reading the court transcript as Rick And Morty below to help tide you over until season 3 airs.